A mountain city of about 75,000 residents, Asheville is still something of an undiscovered gem among many lesbian and gay travelers, although with its relative proximity to Atlanta, Charlotte, and Nashville, it’s definitely becoming more and more well-known as a progressive place to live and visit. This lively university community supports a sizable crop of stellar restaurants and cafés (many of them emphasizing organic and sustainable foods), several cool and welcoming gay bars and live music clubs, and dozens of engaging antiques shops, crafts boutiques, and art galleries. It’s also an excellent destination for hiking and outdoor recreation—it has a moderate climate that produces a bit of snow in the winter but seldom severely low temperatures, and the summer weather is several degrees cooler than in the rest of the South. Downtown Asheville sits like a saucer balanced precariously amid the slopes of numerous and verdant mountains. It’s historically well preserved, with many great old buildings—including numerous examples of Art Deco architecture. In the city’s residential neighborhoods, finely restored Victorian and Arts and Crafts houses abound—many of them now are romantic, upscale inns. The surrounding Blue Ridge Mountains account for much of the region’s appeal—it’s an hour’s drive west to reach Great Smoky Mountains National Park. You can also navigate a stretch of the winding, scenic Blue Ridge Parkway, which passes right through the center of Asheville on its way north toward Virginia. Many other state parks and forests are within a short drive, and right in the city you can appreciate nature with a stroll through the 10-acre Botanical Gardens at Asheville or the 434-acre North Carolina Arboretum. Downtown is great for walking around—it’s also quite hilly, though, so expect to get some exercise. Be sure to stop by the Asheville Art Museum, which has an esteemed collection of contemporary American works, and if you’re a fan of modern American literature, check out the Thomas Wolfe Memorial, which includes a visitor center and the boarding house in which the author of You Can’t Go Home Again grew up. Almost every visitor to Asheville pays a visit to the Biltmore Estate, one of America’s few true castles. The 250-room mansion and resplendent grounds were commissioned by the phenomenally wealthy railroad tycoon George Vanderbilt and executed by Richard Morris Hunt in 1895; right on property, the luxurious, 213-room Inn on Biltmore Estate offers swank accommodations, and nearby Biltmore Village is rife with upscale shopping. You could easily spend a full day here. Asheville has dozens of both funky and fine eateries, and you’ll often see GLBT residents and visitors at many of the city’s leading culinary venues. Set inside one of Asheville’s landmark 1920s buildings, the Grove Arcade, you’ll find a wonderful wine bar (and retail shop) called Sante. The outstanding selection of moderately priced, hard-to-find vintages and simple but flavorful food make this a winner, and the staff is extremely fun and friendly. On the other side of the Grove Arcade, Carmel’s Restaurant and Bar specializes in contemporary seafood and American fare and has a handsome little dining room plus plenty of seating outside along the sidewalk. Flying Frog Wine Bar and Café, a smartly decorated but informal spot along busy Haywood Street, presents a varied menu that includes German, Indian, and American dishes. At Vincenzo’s you can dine on exceptionally good Northern Italian fare in the dining room and listen to live jazz and piano in a bistro on the lower level. Savoy serves excellent modern American fare, such as pan-roasted lobster with rosemary cream. Trendy and darkly inviting Zambra presents a frequently changing menu of tasty Spanish tapas, including pomegranate-braised pork spring rolls and grilled scallops with parsnip-potato gratin. Gay-popular Early Girl Eatery has a tremendous following for its fresh yet somewhat decadent creative Southern fare, including a knockout fried-chicken salad with grits-croutons, and some of the heartiest breakfast food in town. Another Southern-style eatery that’s become legendary for its delicious food using mostly local ingredients is Tupelo Honey—try the breakfast of Eggs Crawley (two eggs cooked any way over crab cakes with asparagus). Laughing Seed serves creative vegetarian fare, and Green Sage Coffee House is an eco-conscious spot with a wide-selection of fine teas and fair-trade coffees, plus local organic beer, leafy salads, egg-and-cheddar biscuits, and delectable sweets. Consider stopping by Malaprop’s Bookstore and Café, a terrific and gay-popular independent bookstore, for a flavored latte or a light bite. Malaprop’s is along a busy stretch of cool shops that include a superb artisan candy-maker, Chocolate Fetish; a hip men’s and women’s clothier, Union; and several excellent art galleries. Be sure to stop inside the old five-and-dime store, Woolworth Walk, which has been converted into a two-floor co-op showing the wares of more than 150 artists who live within the region (there’s also a soda fountain serving sandwiches, ice cream, and root-beer floats). For nightlife, check out Hairspray bar and disco, which is named for outrageous indie film director John Waters and has a kitschy interior designed in his honor. The crowd is eclectic and fun, with more of a lesbian presence than other gay hangouts in Asheville, and campy drag shows keep the crowds entertained. Scandals is a popular gay dance club that draws an all-ages crowd, including quite a few straights—it’s the best place to dance in town, and it tends to be absolutely packed on weekends. Head to the downtown neighborhood tavern Smokey’s After Dark to shoot pool, drink inexpensive cocktails, and mingle with locals before heading out to one of the larger clubs. O’Henry’s is a cruisy locals bar on the edge of downtown that’s a hit with bears and the over-40 set. And women-owned Tressa’s—with live jazz and blues, comedy, and dancing—has a loyal following in the GLBT community. Asheville has several inviting, gay-friendly inns, from upscale historic mansions to cozy Arts and Crafts cottages. The city’s most renowned accommodation is the Grove Park Inn Resort and Spa, one of the nation’s foremost historic resort hotels, which has been fully restored to its original 1913 Arts and Crafts design. You’ll find one of the South’s most impressive spas on the lower level, and restaurants and bars affording panoramic views of the city skyline and surrounding mountains. One of North Carolina’s finest small hotels, the Richmond Hill Inn, comprises an impeccably restored 1889 mansion and several newer outbuildings offering some of the most gorgeous accommodations in the Southeast, many of them with two-person whirlpool tubs and most with fireplaces. The inn is surrounded by 8 acres of Victorian gardens, and many rooms view the surrounding mountains. The staff is friendly, attentive, yet refreshingly unpretentious. The restaurant, Gabrielle, is top-notch and a perfect place to celebrate a special occasion. The stunning shingle-style Inn on Montford dates to 1900 and sits on beautifully landscaped grounds that include the largest Norway maple tree in North Carolina. Rooms contain a priceless mix of 18th- and 19th-century English and American pieces. Herb and rose gardens surround the 1889 shingle-style White Gate Inn & Cottage, one of the city’s gay-owned properties—commitment ceremonies are frequently held here. The romantic, antiques-filled rooms have Wi-Fi and flat-screen TVs with DVD and CD players—they’re named for poets (Whitman, Wilde, Sandburg, etc. ), and one cottage has a gas fireplace and full kitchen. A stay at any of these first-rate properties may have you understanding why gays and lesbians are steadily becoming enamored of Asheville’s many charms. Carmel’s Restaurant and Bar (828-252-8730, www.carmelsofasheville.com). Early Girl Eatery (828-259-9292, www.earlygirleatery.com). Flying Frog Wine Bar & Cafe (828-254-9411, www.flyingfrogcafe.com). Green Sage Coffee House (828-252-4450, www.thegreensage.net). 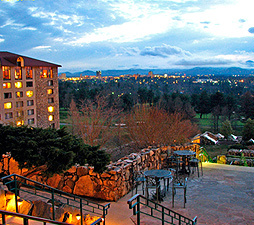 Grove Park Inn Resort and Spa (828-252-2711 or 800-438-5800, www.groveparkinn.com). Inn on Montford (828-254-9569 or 800/254-9569, www.innonmontford.com). Malaprop’s Bookstore and Cafe (828-254-6734, www.malaprops.com). Richmond Hill Inn (828-252-7313 or 800-545-9238, www.richmondhillinn.com). White Gate Inn (828-253-2553 or 800-485-3045, www.whitegate.net).